Our arborists are certified by EVO Energy and trained by TAFE NSW in Vegetation Management. Evoenergy-accredited tree surgeons are trained to follow safe work practices in the dangerous environment near powerlines. Regular refresher training is a requirement to maintain our certification and to continue to operate at the highest standard in vegetation management around Evoenergy electrical network. 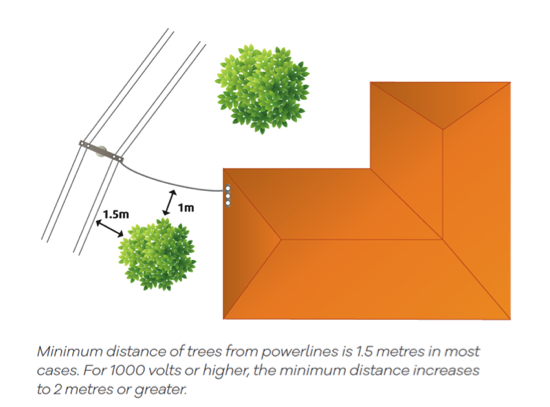 Trees and shrubs on your property need to be kept clear of power lines by 1.5 metres from low voltage lines and >2 metres from high voltage lines. Evoenergy recommend a clearance of up to 2.5 metres to keep the trees clear for up to 3 years. When pruning near high voltage line we submit a ‘System Switching Request (SSR)’ to Evoenergy notifying them of the time and location we will perform the work. The reason for this is safety. If the High Voltage lines short out from a branch, plant or machinery encountering them they will not re energise. In some situations, clearing a tree to these clearances cannot be achieved. Clearing to these distances may not only affect the health and form of a tree but can in extreme cases may increase the likelihood of branch breakage and even total tree failure. Our quoting arborists respect trees have the experience and knowledge to ensure no unnecessary pruning is undertaken. Pruning trees from power lines needs to be done in a way that does not increase regrowth unnecessarily and keep pruning wounds neat and clean to assist in tree recovery and limit the risk of infection by pathogens such as decay fungi.